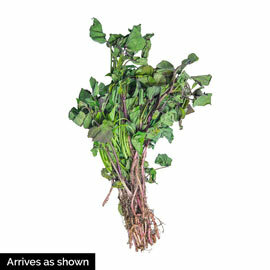 Beauregard Sweet Potato | Henry Field's Seed & Nursery Co. Outstanding color and high yields has made this a top choice year after year. Our earliest-maturing variety, it's a favorite for northern gardeners. 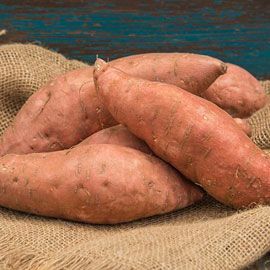 It produces high yields of red-copper tubers with deep orange flesh. Very little cracking. An excellent choice for baking and making into pies. 90 DAYS. Height 1 1/2 to 2 feet tall. Soil Requirements: Well-drained soil with some organic matter. I've grown Beauregard Sweet Potatoes a couple of years, and they will spoil you. After these, you just won't want any other variety; It's Beauregard or nothing. With other varieties, a little brown sugar is nice. With these, you don't need anything, aside from a touch of butter. Sweet, smooth, deep reddish-orange flesh never has fibers...Simply the best! And how about size? Very few 'fingerlings'. Plenty of nice baking size sweet potatoes, as well as many football sized ones!